Remarks by Eva Grosman (CEO, Centre for Democracy and Peace Building), Europa Hotel Belfast, 27 November 201relationships5. 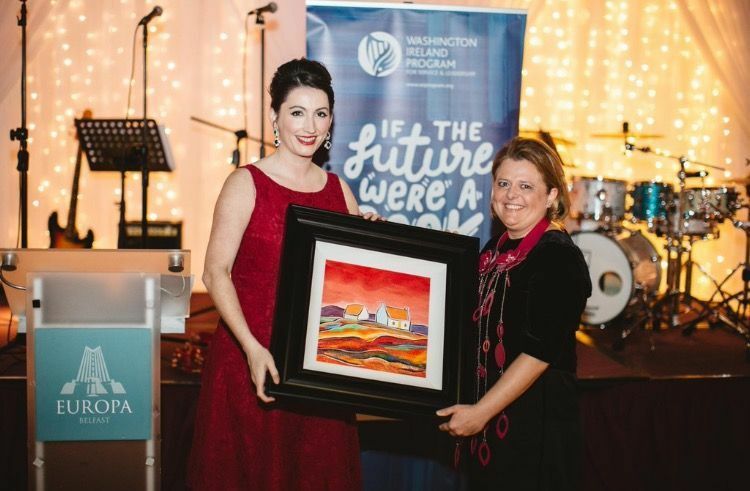 Eva was speaking having been presented an inaugural ‘Spirit of WIP’ Award at the WIP Ball by WIP Alumna and Junior Minister, OFMdFM, Emma Pengelly MLA. Almost every day of my working week I interact with ministers, MLAs, business and civic leaders and other remarkable individuals, who took part in the Washington Ireland Program. Being a change agent, working among people like you, often feels like being part of an invisible tribe. When Seamus Heaney passed away, Gary Lightbody wrote a wonderful piece to honour his hero. He talked about Heaney as a Chieftain of an “invisible tribe” – a tribe of people that touch others on a level that beds deeper into our souls and hearts. People of profound light, love and kindness that simply and maybe even without their knowledge make us and the world around them better. People that make us feel safer, happier, stronger, more centred and less confused. The Washington Ireland Program is like of a boot camp for the members of the “invisible tribe” – a school of better living for the warriors of good. I was asked to share with you and idea for brighter 2016. So, I thought why not focus on improving a quality of our relationships and quality of public discourse. I’m sure that you all watched CSI Miami or one of the similar programmes. I’m sure that you are well aware that every human contact leaves a trace. And it goes beyond the DNA. In recognising qualities of good leaders, we are now moving from IQ to Emotional Intelligence and from Emotional Intelligence to a Cultural one. Cultural Intelligence is the ability to cross divides and thrive in multiple cultures. It is something which we continuously improve and develop. We do this through our experiences, but also with knowledge shared by other people whom we trust – and who trust us; via networks such as Washington Ireland Program. President Clinton spoke last year at the Riddel Hall, here in Belfast about the need for new creative networks of cooperation – cooperation between public, private and community sectors. To achieve this we need leaders who can cross boundaries and cross cultures, leaders who can communicate effectively and build diverse networks necessary to solve “wicked” problems. We need leaders who don’t just shy away from difference but gravitate towards it. Those are the leaders with Cultural Intelligence and these are the members of the invisible tribe. Being a member of the invisible tribe it’s not only a privilege – it is also a responsibility. We have to lead with our words and our deeds. So let’s think about the words – words are powerful – they can start arguments, even wars, and they can bring forgiveness and peace; words can hurt and words can heal. With elections coming up, both in the Republic of Ireland and here in Northern Ireland we have a perfect opportunity to challenge and change the quality of political discourse. Perhaps we can focus on positive agenda, positive ideas and our shared future. On Thursday, 21 January WIP and the Centre for Democracy and Peace Building will be hosting a workshop in partnership with Twitter to develop a campaign to re-frame conversations and to challenge folly, evasions and hatred in our political and public discourse. The project will be underpinned by a sense of hope, possibility and respect, as well as sense of a personal responsibility. We have to be good stewards of our gifts. We have to protect our time, avoid too much noise and be ourselves and at our best as often as we can. We shouldn’t let people pull us into their storms, but we should pull them into our peace and joy. We have to collectively be bold enough to raise standards of everyone around us, so I invite you to join us in this new project. We will need to tap into your talents, ideas and networks. So let’s make 2016 a call to arms for the invisible tribe. Let’s work hard, play hard, do some good and hope for a “great sea-change”. And most of all – let’s think before we speak.